Cover Description: This book has at least 4 different covers. 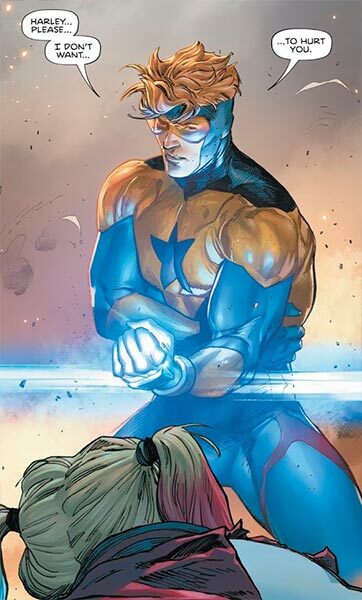 Booster Gold is seen on two of them, and his goggles appear on a third (worn by Harley Quinn). 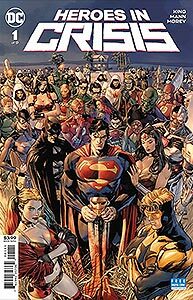 Brief Synopsis: Booster Gold and Harley Quinn fight in the aftermath of a slaughter in the Sanctuary program. Booster Gold is sitting, in costume, at a counter drinking coffee in Rich's Cafe in Gordon, Nebraska. The diner is decorated in stereotypical kitsch Americana, including references to several 1970 and 80s television shows. For example, the white Hawaii license plate over the nearby unisex bathroom door reads "ROBIN-1," which was the license plate of the Ferrari 308 GTS driven by Thomas Magnum on the television show Magnum, P.I.. The nearby blue California license plate "853 OKG" was the plate number of Jim Rockford's Pontiac Firebird on the television show The Rockford Files. Both of those shows were about detectives. Perhaps unrelated, the waitress behind the counter, Shirley, is dressed similar to the cast of television's Alice. POWER DOWN: After eating a piece of peach pie — for four pages — and quoting the Sigmund Freud, Harley ambushes Booster, stabbing him in the back and forearm with an unusually sharp piece of dinnerware. At no point does Booster use his force field to defend himself, only his Booster Shots (which blow out all the windows in the diner). Booster decides to take Harley into custody and flies her directly up through the roof of the cafe. That's a lot of property damage, Booster. Are you sure Harley is the villain here? POWER DOWN: To escape, Harley stabs Booster in the neck. This understandably disrupts his ability to concentrate on mentally controlling his Flight Ring and, as a direct result, the pair fall out of the sky. Back-of-the-envelope math indicates that they are approximately 1,000 feet up and will hit the ground in about 8 seconds. Boosterrific Review: To say this issue is light on content is an understatement. If you read the advance solicitation for this issue, you learned more about the story than what this book tells you. What exactly was Sanctuary? What happened? Who are the suspects? How many issues will we have to wait to learn the answer to any of those questions? At least while we're waiting, we can admire the fantastic art by Clay Mann and Tomeu Morey.